PHUKET: Three drug mules from Suratthani were arrested this morning at the Thachadchai Checkpoint after they were caught trying to smuggle 2 kilos of Crystal Meth onto the island early this morning. Based on today’s street price of B3,000 a gram, the haul would be worth B6 million retail. The drugs, wrapped in multiple layers of packaging, were found concealed on a woman passenger of a black Honda Civic with Bangkok plates that was stopped for a search at about 2.30am. 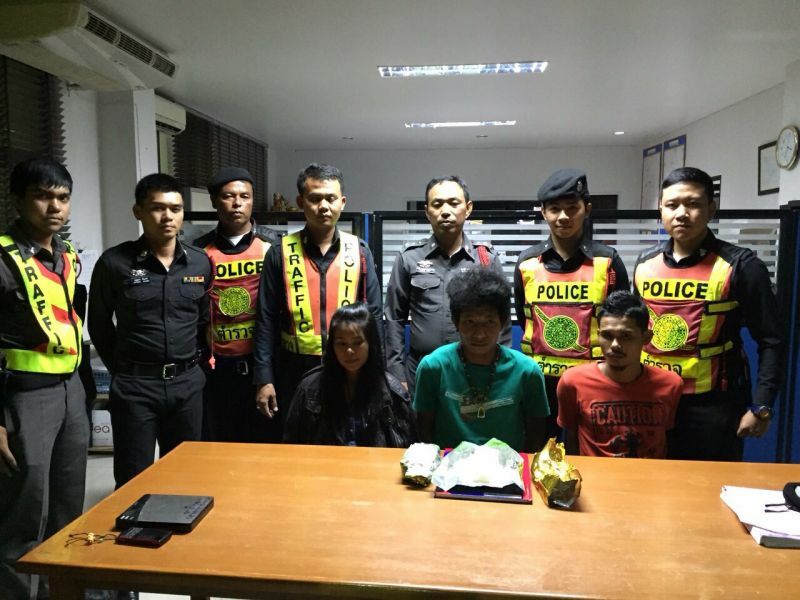 The woman, named as 24-year-old Apaporn Jiewmaidaeng told police that she was given the drugs by another male passenger, Mr Tatsanai Saendee, 28, to hide under her shirt as the car approached Phuket from Phang Nga. Sitting in the front passenger seat, Mr Tatsanai admitted to picking up the drugs at a pedastrian bridge between the districts of Phra Saeng and Wieng Sa, the police report read. The driver, 28-year-old Chaipichit Kaewkarn — lover of Ms Apaporn — told police the drugs were to be delivered to a woman named Ann, the girlfriend of another male friend named Nen, who was scheduled to pick the drugs up at Tha Reua in Thalang, a plan that has now been compromised. Meanwhile police recorded the phone number of Ms Ann and charged all three mules with possession of category 1 drugs (ice or crystal meth) with intent to sell.